This is actually a duplicate post. I published almost the exact same thing on my homesteading blog because it's appropriate for both blogs, though for different reasons. That part of my life is certainly demanding most of my attention these days, but I am still a weaver and fiber person at heart. After a lot of thought and some trial & error, I've finally settled on a set-up for my studio. 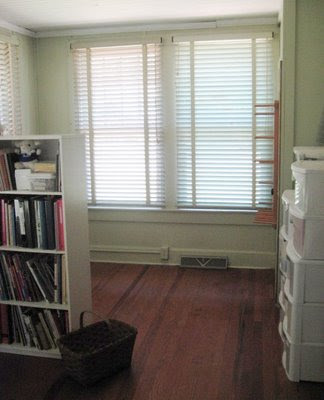 This was formerly the "sun room," claimed as my studio on first sight. The room is long and narrow, about 9.5 by 20 feet, and this presented some challenges. My loom takes up roughly 6 by 5.5 feet worth of floor space, so where to put it took some deliberation. I finally decided to start with it near the living room entrance, as the width of the double French doors afford a little room there. Part of the problem is having enough floor space to walk around all sides of the loom. 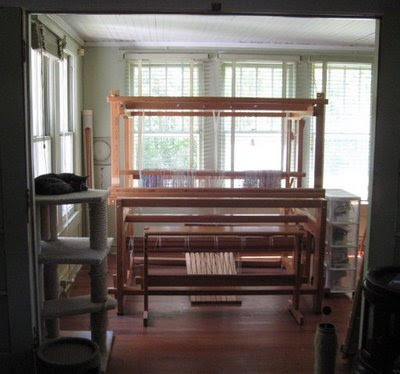 With this set-up I have 18 inches of space in back of the loom, and 20 inches on the left side. I'm going to work with this awhile, and if it's not adequate I'll make adjustments. The long tube on the floor behind the loom is a reed holder. It was handy previously, but it's in the way now. I'll have to come up with another way to store my reeds. 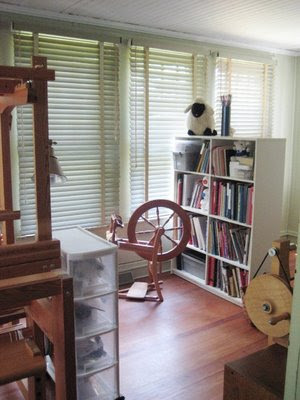 To the right of the loom I left the floor open, and used a book shelf to define both studio and office space for myself without blocking the windows. This will be my "office" area. That's not a permanent home for my warping board, just a handy place to keep it. Eventually the closet will be replaced with more shelves. My Sterilite stackable drawers (full of weaving yarns) are in front of the door which goes out to the screened in front porch. Though I like the idea of being able to use this door, I really don't need it. In the corner between the closet and my stackables is my tri-loom and raddle. These shelves were left in the house. 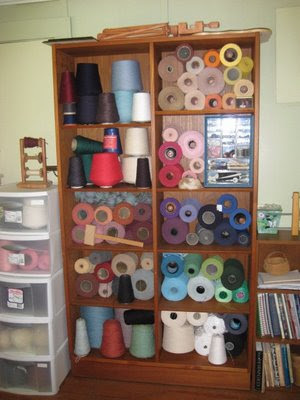 I was able to get a lot of my yarns out of boxes and stashed here. 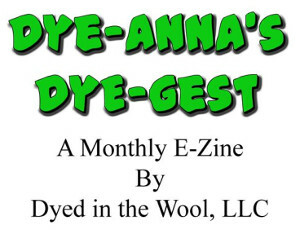 I really like being able to have at least some of my yarns visually handy. The other little shelf unit contains most of my weaving books and is handy for my bobbin winder. 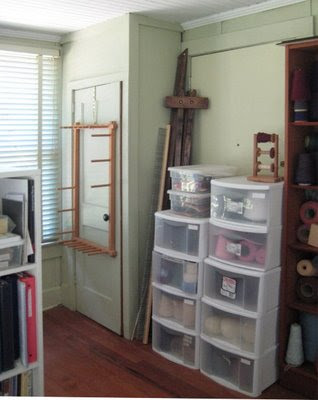 Hopefully the space between this shelf and the loom will be adequate for entering and exiting the rest of the room. The rest of my stash: weaving yarns, handspun yarns, commercial knitting yarns, and all my fleeces and other spinning fibers, (as well as my sewing machine, serger, and dye equipment) are in the spare room. Being a "try it and see" sort of person, I figured that the only way to know how well this Hopefully I'll have something to show you on that front soon. Nice set up! And good find with the shelves! I have a hard time imagining that people could actually leave shelves behind! Glad to see its coming all together. Just make sure the yarns are not 'too' exposed to daylight. They can fade in weird ways even if not exposed to direct sunlight. It looks so nice, I really like how you have set it up. Are your wall painted a light green or is that just the picture? I like reading your posts! Your studio is looking great. Incidentally, I think we have the same bird clock! I am sooo....envious! But I do have one comment/question about loom placement. 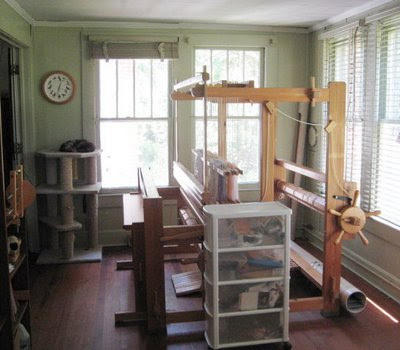 Since my loom is in kind of a breakfast room nook with windows on two sides, the setup is similar to yours, just much much smaller! I had debated whether to situate the loom so I looked out the window or with my back to the window. Much as I wanted the ability to look out, I opted for sitting with my back to the windows so that the light would come from behind. The result is much better light for weaving. Of course I know you can hardly wait to turn that loom around.....(grin!). One other reason is that I need more room at the back of the loom for warping than I do at the front of the loom. Yes, those shelves are a real blessing. I'm always on the look-out for more, and claimed these for yarn as soon as I saw them. Good point about the sun Laritza, though I think these are in a safe spot. Ana, how funny about the bird clock. Mine is an Audubon Society one, a gift from my son a number of years ago. I know that these come with different birds and I once thought to try and collect as many different of these tweeting clocks as I could find. DH said no. Peg, I thought about the arrangement you speak of, but decided to try it this way first. We'll see. I warp back to front, so I'm hoping I can get away with this. If I do end up needing more room at the back of the loom, I will probably try turning it around. You're correct about the view, but I agree, good lighting is essential. Nice!! I like peeking over your shoulder. And, of course, you are wise to leave a spot for a feline attendant. You sure have been busy. Your studio looks great!! Like any room or house they are always a work in progress. I see one of your helpers has made himself comfy. 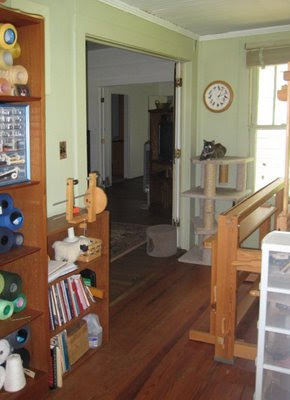 Your studio looks fantastic, I am really envious! what a fantastic inspiring work space. I'm very envious - all that natural light. It has a lovely creative feel about it. What a wonderful space! I agree with Pat- it would be terrifically inspiring to have a space like that - you must be thrilled! What do your "inspectors" think about the new house? Hugs - T.
There's an award for you to pick up in my blog, hope you don't mind. Oh, Leigh, how lucky are you! Seriously, you've got a great set up there and look forward to seeing your new work. I also see the room/space has been "christened" by himself, but where's the champagne? Congratulations on the advent of "Your Space" finally coming a reality, Leigh. Cheers! What an inspiring place to weave! If you have the right feeling in the space then you'll feel okay with making do with tight quarters and moving stuff to try new positions. My studio is a sage green and it's a beautiful colour to weave by. Your studio is looking very pristine. I hope I am as successful as you have been in establishing a good working area for your weaving. My loom is the same size as yours - as you point out, it's not just the size of the loom that you have to consider, it's all that area you need to get in behind it and to the sides. I am jealous. That is all I can really say. I am going back down to my fiber dungeon. I go out of town for four days and you have rearranged the whole world to look much better than before. I love the set up! 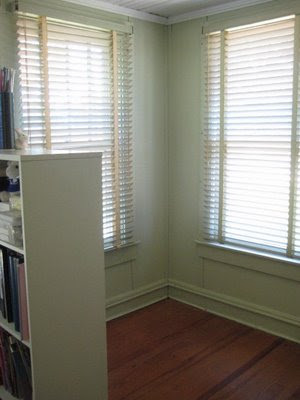 I can see how you arrived at the placement of your bookcase and where the computer desk will go. You did a great job and I love that you put blinds up. I was worried about your fiber fading in the sun! Really super job! I know great weaving will continue in there. I think if I had a studio like that, I would lock myself in....and wouldn't come out for days.